Guess I’m going to have to try harder next time…But what will the oracle predict for YOUR future? Inquire if you dare! …with this 3D recreation of central Rome in the late antique period. This project is apparently aiming to produce a whole series of models of Rome at different periods, from c.1000 B.C.E. – 550 C.E., so hopefully this will be the first in a long series of video tours of the Eternal City! 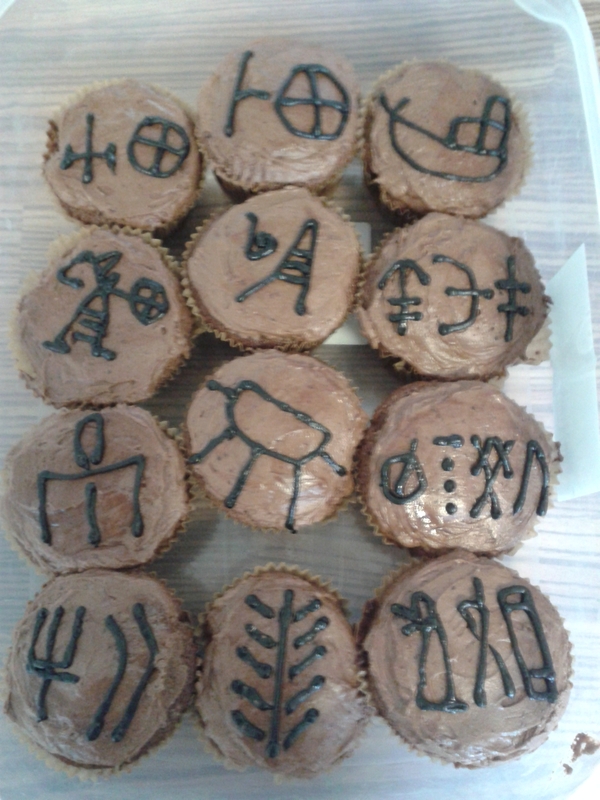 I was starting to think it was high time I got round to doing some more linguistic baking, when a fellow linguist conveniently had a birthday…so here they are: Linear A cupcakes. Like Linear B, Linear A is found written on clay at Bronze Age Cretan sites. As well as larger tablets, both Linear A and B are often written on ‘sealings’ or ‘nodules’: small lumps of clay that presumably recorded individual transactions, perhaps to be compiled on a tablet later. Handily, these are very suitable for representing in cupcake form. The examples here with two or three signs may be names of people or places who were contributing or receiving goods, while the single signs probably represent commodities (the sign in the middle of the third row, for instance, looks like some kind of tripod to me). Claire Jackson started off this week’s GIS with a paper on ‘Ancient Fiction and Forgery in Antonius Diogenes’. After explaining some of the problems with studying the concept of ‘fiction’ in the ancient world, she looked specifically at Antonius Diogenes’ novel τα ὑπὲρ Θούλην ἀπίστια (‘The Unbelievable Things Beyond Thule’ – Thule being a semi-mythical land located somewhere to the north of Europe), which survives only in fragments and a plot summary by Photius. This summary reveals the strategies used by the author to present the novel as ‘documentary’, backed up by authentic sources, but simultaneously to undermine that status by referring to these claims as false.